Hallway, lounge or bedroom, there’s nary a space that doesn’t benefit from a little thoughtful lighting, and our go-to every time for a quick interior pick-me-up is a gorgeous table lamp. Below, we’ve rounded up our pick of the best table lamps in the shops at the moment, be they subtle or statement-making, glamorous or pared back. But first, a little advice. Looking for more home lighting? Have a browse through our buying guides for lots of trusty recommendations. Black Friday and Christmas are fast approaching, so you've chosen a great time to get deals on home lighting. While it goes without saying that we’re all in favour of the aesthetic here at Real Homes, when it comes to lighting, it’s not just about looks: the type of lamp you should look for depends heavily on where you’ll be placing it, and what function you’ll expect it to perform. Task lighting is a practical solution normally used to accompany activities like reading, sewing or drawing, but that functionality needn’t mean unexciting design. Simply look for a table lamp or desk lamp that offers a more focused beam of light, and as a bonus, an adjustable head for angling just where you need it. Ambient lighting gives the opposite effect, especially useful for large rooms whose darker corners need a little lift, or creating a mood in cosy bedrooms or sitting rooms. Look for something that gives off a soft, diffused light, like a bulb encased in an obscure glass shade, or even a retro lava lamp. Or, if you’re really hot at this interior design thing, consider employing accent lighting to make a special feature of your statement pieces. Finally, the boring but necessary bit: most lamps don’t come with bulbs included, so be sure to check out the kind your favourite lamp takes and stock up before it arrives for instant enjoyment on opening the box. Strange as it might sound, this Jasper lamp from Village at Home takes our top spot for best table lamp not for statement-making style, but for its ability to pair beautifully with almost any room scheme you put it into. Its neutral colour palette guarantees it won’t stick out like a sore thumb no matter the colour of your other furnishings, but the variety of textures keeps things interesting, bringing together soft slubby cotton, brushed gold and cool matte concrete to make a lamp that remarkably bridges the gap between timelessness and trendiness without compromise. 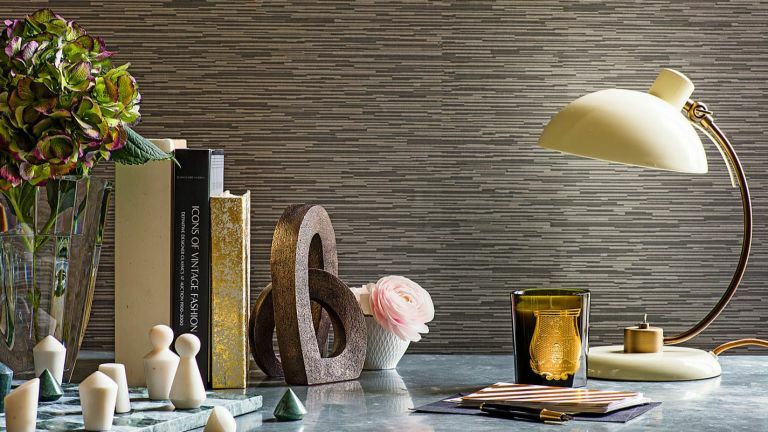 When furnishing a glamorous living room or bedroom, a statement lamp is just the thing to kick it up a notch, and they don’t come much more statement than this shimmering mosaic lamp from Wilko. While it is on the larger side, it doesn’t look cumbersome thanks to its gorgeous design, and it brings a hit of texture to neutral rooms. Its black finish shade fits in with almost any colour scheme, too. If you’re a bit of a modern maven when it comes to interiors, with your hairpin leg furniture and copper accents already nailed, take this table lamp for a whirl. Its trendy base is the best of both worlds: angular enough to give a modern look but with curves in all the right places so as not to look too industrial. The shade is a striking opaque black that offsets the copper beautifully, but lets just enough light through when illuminated to give a warm glow. Plus, it looks far more expensive than its small price tag suggests, so picking up one for each side of the bed gives a superbly stylish effect without breaking the bank. The perfect addition to any home, no matter the style, this Maisons Du Monde table lamp will be sure to (literally) brighten any room. It's rather large, so will make a statement, and it gives off a warm light, creating a cosy ambience. Boho, Scandi or even minimalist, whatever your interior style, this light will blend in. If you prefer neutral colour schemes, you’ll no doubt know all about the importance of texture in interiors, especially in plush spaces like the living room or bedroom. If you’re looking for the finishing touch to a fresh, clean all white space, but your tastes run more contemporary than Scandi-chic, give this handsome lamp a try – we’re sure you won’t regret it. This petite drop-shaped lamp is cosiness personified – for those looking to inject a touch of hygge into their bedroom or living room, adding one of these to an end or bedside table is a beautifully simple way to do just that. With its combination of luxe mirror glass, rose gold, and an ombre finish, it ticks all the boxes when it comes to trends, but those warm tones also go a long way to giving the lamp its intimate air. Reviewers have commented favourably on the comforting glow it gives off, so for real relaxed mood lighting, look no further. John Lewis have hit the nail on the head, trend-wise, with this ultra-cool lamp. In a choice of shades du jour – chartreuse, teal and slate, as well as the subtler cream – and with an unusual curved stem, it takes mid-century modern cool and gives it a contemporary twist. Reviewers say the warm, soft light it gives off is perfect for reading and that the angle-adjustable head makes it ideal for crafting and other close-up work, and loved the unique little details like the old-fashioned switch and flex cable. This on-trend light would sit very nicely on any bedside, perched on an occasional table or lighting up a hallway. It comes in both brass and nickel, and will be sure to make a statement. Unlike other table lamps, it has the bulb included, which is from Tala bulbs who are eco-conscious, claiming that for every 200 bulbs they sell, they plant 10 trees! Win win? In a flawless meeting of retro and modern, the classic lava lamp is brought bang up to date with an ultra-trendy rose gold colourway, making it perfect, we think, for a discerning teenager’s room. It’s not strictly a lava lamp, replacing the iconic wax with particles of heart-shaped confetti, which adds an extra touch of girliness to the glam brushed metal base. But, like the original, it’s great ambient lighting – not bright enough to read by, but perfect for chilling out to in the evening.